I have a slight obsession with this TV show Supernatural. Well, it’s about to conclude it’s ninth season next week and then next year is the last season. When I watched the latest Supernatural episode, Stairway to Heaven, I kept getting this weird feeling. I thought I’d explain my theory on how I think Supernatural is going to end. Who remembers this scene from the Croatoan episode 9 in Season 2? Where Castiel has to explain to Dean that he’s not an angel anymore. I thought season 9 was completely ignoring End!Verse, but look. 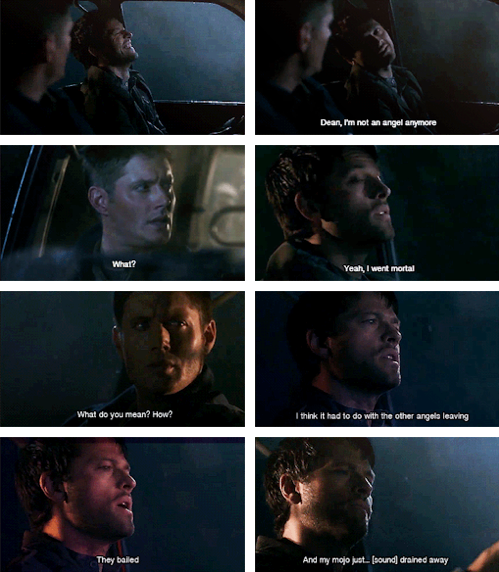 Cas took another angel’s mojo. You know what this means? Metatron told Cas that this mojo can drain away, because it’s not his. His borrowed grace does drain away, Hence, what he’s talking about in the above scene. Then other angels left him, they bailed. Remember what Metatron said? Something along the lines of “In my story, you’re the villain.” Metatron made Cas out to be the villain to the other angels in the latest episode because he sided with humanity and not the angels. Not to mention Metatron’s suicide bombers who claimed to be doing things in Castiel’s name. At first I thought that End!Verse was something that we would see if Dean and Sam hadn’t stopped Lucifer. That once Lucifer was in the cage End!Verse would be irrelevant. Yet, remember what Sam said to Dean in Croatoan? Since Sam has already said yes to Lucifer, the Devil doesn’t need permission to posses Sam again. So what if that’s how Supernatural really ends? With Lucifer back from the cage somehow and Dean dead? Once again this is just a theory. I’m interested in hearing what other people have to say. So please don’t be afraid to comment with your thoughts and ideas.